Out of Africa: A new paper by Christy on surface temperature issues | Watts Up With That? More weather station photos from Africa here. These stations shown and linked above are not GHCN stations as far as I can tell, but the siting was interesting nonetheless. Surface temperatures have been observed in East Africa for more than 100 yr, but heretofore have not been subject to a rigorous climate analysis. To pursue this goal monthly averages of maximum (TMax), minimum (TMin), and mean (TMean) temperatures were obtained for Kenya and Tanzania from several sources. After the data were organized into time series for specific sites (60 in Kenya and 58 in Tanzania), the series were adjusted for break points and merged into individual gridcell squares of 1.258, 2.58, and 5.08. Results for the most data-rich 58 cell, which includes Nairobi, Mount Kilimanjaro, and Mount Kenya, indicate that since 1905, and even recently, the trend of TMax is not significantly different from zero. However, TMin results suggest an accelerating temperature rise. generally have sparse coverage of East Africa. The differences between TMax and TMin trends, especially recently, may reflect a response to complex changes in the boundary layer dynamics; TMax represents the significantly greater daytime vertical connection to the deep atmosphere, whereas TMin often represents only a shallow layer whose temperature is more dependent on the turbulent state than on the temperature aloft. become separate variables in the study of long-term changes. 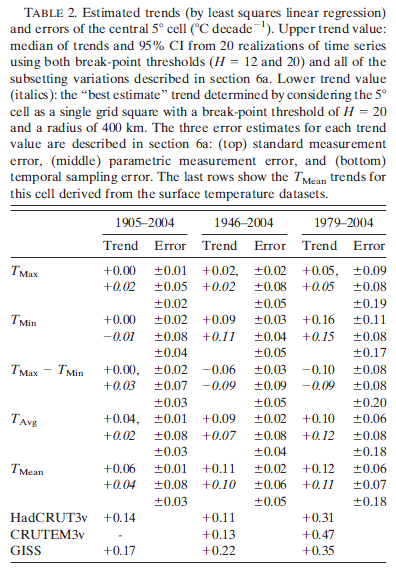 c. Possible causes for TMax and TMin differences The fact that the trends in the two temperature measurements (TMax and TMin) are likely significantly different encourages an examination of the causes for the warming of TMin and the significance of trends in TMin in the context of tracking global climate change. Given a lack of detail on station siting and uncertainties in specifics on the boundary layer in East Africa, definitive reasons for the trends may not be available. However, general aspects of boundary layer behavior may provide some guide for interpreting the trends.Thus, the following should be viewed as a context and hypothesis for the trend differences that deserve discussion and further attention. were varied, the range of 60.108C decade21 is plausible. The fact that the difference in trends in TMax and TMin continues, and in fact accelerates, in the period of 1979–2004 in East Africa may be important in interpreting the results of Vose et al. (2005). While it is possible that East Africa difference trends are indeed different than that of the globe as provided by Vose et al. (2005), there is concern that the reduced number of stations in the 1979–2004 GHCN dataset may not be sampling many of the areas of the globe that are behaving like East Africa. Thus, it is important that the GHCN dataset be expanded to include more stations distributed around the globe. The noticeable difference in trends of TMax and TMin implies that daytime and nighttime temperatures are responding differently to environmental factors. Changes in the surface characteristics and the boundary layer atmospheric constituents may be responsible for the relatively recent and rapid rise in TMin. There appears to be little change in East Africa’s TMax, and if TMax is a suitable proxy for climate changes affecting the deep atmosphere, there has been little impact in the past half-century. data indices now used to detect climate change. At the least, the time series of both TMax and TMin should become separate variables to be studied for long-term changes. July 18, 2009 in Climate data, measurement, Weather_stations. ← IPCC lead author on Global Warming conclusions: "we're not scientifically there yet." I would say the reason of discrepancy is clear. In looking at the latest report by NOAA on global temps., it seems central Asia is in a heat wave. Checking some of the stations, in that area, at http://www.rimfrost.no, many stations seem to be having normal temps. Ditto for Australia, and New Zealand. What is Tmin? If this is nighttime temperatures, isn’t that the expected behavior when temperature rises? Most of the warming is at night and in cold places. Increased Tmin is a good indicator of UHI. Based on GH theory, there should be not much warming in the tropics, but in polar regions where the prevalent GHG – water vapor – is much reduced compared to tropics. MikeN: Tmin is the low temperature, which usually is at night. Tmin is expected to rise if the night sky is trapping heat, whether due to greenhouse gases or cloud cover. It also can rise if the thermometers are all on concrete which keeps warmer at night, or if a warm city grows up around the thermometer. I spy, a nice concrete plinth beneath and around the sensor. When did that become a site standards requirement ? And under a tropical sun too. I thought it had to be above a grassy surface. It would seem the Hadley and GISS anomalies for most of Africa are vapadata as calculated by scareware. The funny thing is, they can’t send the boys round to tell John Christy to get off their turf, since they don’t have any stations there. it seems odd that the entirety of Africa and a good part of the oceans show positive anomalies. These seem to be areas where our measurement capabilities, especially in terms of accurate historical baselines, are most limited. And what the hell is going on in Siberia? In looking at the latest report by NOAA on global temps., it seems central Asia is in a heat wave. Checking some of the stations, in that area, at http://www.rimfrost.no, many stations seem to be having normal temps. The rimfrost data appear to be from NOAA too. Am I wrong? SIberia, like Alaska, have a summer roughly once every decade. In dry, smiearid places, like Central Asia and East Africa, there isn’t much water vapor to act with the CO2. So, by AGW theory, no global warming should be taking place. Tmin should have a very high separation from Tmax, not a closing gap. It’s the concrete for the station we see. The rest of it is fabricated station polluting with the aim of “correcting” all good stations to the rotten egg station. Just like they did for June in my area. I know what the condition are here, it’s where I live. I noticed that myself. This is why I have been asking if GISS’ outliers are temperatures that are eliminated. We have had a few ‘outliers’ through June and July. The high temp in Ohio for a date in the middle of July? 70ºF. Low is 52. Would these be dropped as outliers? I don’t know for sure, but they are the real temperatures I have today. I guess you could call this a “test” of the accuracy of GISS, Hadcrut and the NCDC (and potentially the adjustments done to the temperature record by these agencies). This test says the trend from these agencies from 1905 and from 1979 are more than twice too high (although the lower trend from 1946 seems to be good). In a way, it is also a test of whether the lower trends from the satellite measurements of the lower troposphere are accurate as well. Seems to be a passing grade for this test. I think there needs to be several more of these papers covering other areas for additional confirmation. Of course, this will need to be done in double-blind / objective way like medical studies use so that confirmation bias does not creep in (ie. someone other than Phil Jones, James Hansen, Thomas Karl and even John Christy needs to do them). “In looking at the latest report by NOAA on global temps., it seems central Asia is in a heat wave. Checking some of the stations, in that area, at http://www.rimfrost.no, many stations seem to be having normal temps. Ditto for Australia, and New Zealand. earlier a commenter said Tmin was at night. Not always. Sometimes it is after first light. There are interesting results from a study of resords from Mount Gambier in South Australia by Jonathan Lowe. J. Bob (08:41:16) : Temperatures here in New Zealand are indeed about normal for the time of year. For the region where I live (Waikato, central North Island), June was the second coldest on record (coldest was 1972) – mean temperature 7C, which is 2 degrees below normal. More snow today for southern and alpine parts of the country. The skifields are having yet another bumper year, after being told back in the 90s that they had no future. Bill Illis (12:11:33) : So far Christy has painstakingly put together studies likes this for: ALbama, California, East Africa…More needs to be done but it is a LOT of work just collecting the data. Recall that Christy has stated that he often collects ten times as much data as the popular datasets use. If only more people would be interested in doing this research. MikeN (08:52:52) : If this WERE true, then you would tend to still see significant warming in Tmax, which is connected better to the upper air. And of course there is a great danger of mixing up the signals. Seems like a landuse signal to me! Hanford Airport was mostly asphalt and concrete. We eneded up putting it on a small sand dune,as there was only sand and sage there at the time. form on the ground at that time. Night time temperature inversions do shield the lower boundary layer from the “dynamics” aloft. The strength of the inversion for those areas in the tropics is dependent upon the absolute humidity. In a Maritime Tropical (Mt) airmass, there is less radiative cooling as compared to a Continental Tropical (Ct) airmass. Desert inversions can be fairly extreme with as much as 40 deg F of radiative cooling at night. In the more maritime regions of the tropics, the radiative cooling can be as little as 10 deg F. As a consequence, the Maritime Tropical regions see higher nocturnal winds and more turbulent mixing. An interesting thing to examine in relation to East Africa is subtle changes in the Southern Oscillation over the last 40-60 years that may have affected humidity there. Obviously land changes also would have a more direct impact upon humidity in East Africa. Mt Kilomanjaro has seen its high level glaciers recede not because of AGW, but because of less precipitation in the higher altitudes. Could changes in farming in East Africa have lowered the abolute humidity there, and thus lead to lower nighttime lows? On average Tmin occurs after dawn when solar heating overcomes the effect of radiative cooling. This is true for all lattitudes. The time of Tmin after dawn is longest at high lattitudes in winter. The Indian monsoon is late this year. This monsoon is caused by a summer heat low in central Asia. The monsoon typically reaches central Asia around this time of year. So rather paradoxically, unusually high temperatures in central Asia are due to a lack of monsoon clouds and rain, which in turn are due to an unusually cool summer to date. I suspect they know what the problem is, but can’t come out and say it, because it is a rather large nail in the coffin of AGW. Increasing Tmin isn’t caused by warmer nights. It is caused by increased early morning sunlight. Thus reducing the period after dawn when radiative cooling exceeds warming from the sun. The cause may be reduced aerosols, reduced low level cloud or some other cause. But it can’t possibly be GHGs. * There may be a UHI signal affecting Tmin as well. WAZUP – The best I can tell is that they get them from a variety of sources. So far I have been using them to get long term temperature data ( Uppsala-LAN, Paris, Basel-Binn, etc. ), along with the Central England data. I’m trying to put the 1850 onward HadCrut3 data into a better perspective. The Central England data is good, but only one source. Allen M. Check out the indicators from Australia on the Mar-May temp anomaly graph from NOAA. Go to Rimfrost , “raw data” and look at Perth, Alice Springs and Melbourne. The “raw data” looks more normal then high. Just an update from the weather is not climate, and we may not count it anyway department. Didn’t even hit 70 today. Makes me wonder if the low of 52 could drop into the 40s. Also makes me wonder if that will even make it into the official climate record. T Mean tells us very little about the thermal dynamics that drive biological systems. Consider plant growth, e.g. the grape vine. Temperatures below 10°C in the presence of light can bring about photo-inhibition whereby the leaves will not photosynthesise even when temperatures become more favourable. Carbohydrate generation is slight at temperatures below 15°C, peaks at about 25°C and is gradually inhibited as temperatures rise above 30°C. The Rolls Royce situation for data analaysis is spot readings every 20 minutes. A passable job can be done in predicting plant performance with hourly data. T Mean calculated as (TMax +T Min)/2 can be two to three degrees either side of a true average of 24 hourly readings. I suspect that in twenty years or less, peer reviewers will be throwing out papers that rely on T Mean on the basis that this statistic provides no indication of the thermal conditions driving biological systems. Christy’s paper points us in the right direction. When people ask me what I like about climate research, I tell them, “Everything: The psychology, the politics, the complexity of nature.” People intuitively understand that the complexity extends into the stakeholder dimension. Interesting comment Philip_B. I have not studied the science of diurnal temperature change. However, I had assumed that GHG would lead to less radiative cooling at night and warmer dailly minimal temperatures. Some of you are saying that cooler minimal temperatures could not be due to GHG. What is the basis for predicting tht GHG would have a greater effect on the maximum, rather than the minimum temperature? At last, someone realizing that “averages hide more than they reveal – emsmith” and that min and max need to be looked at separately to have any clue what is really going on. I love it. “Meteorological Services in Zimbabwe were initially established as an Office under the Ministry of Agriculture through a Parliamentary decree in 1925. Earlier on, from 1897 to 1920, the collection of meteorological statistics was a part-time duty the “Statistic” and later “Agricultural Engineer”. The original concept was the establishment of about a dozen climatological stations equipped to record pressure, temperature, humidity and rainfall. The duty of observation was to fall to Civil Commissioners. The first stations to be established were at the then Salisbury (Harare), Bulawayo, Gwelo (Gweru), Fort Victoria (Masvingo), Tuli, Belingwe (Mberengwa), Umtali (Mutare), Hope Fountain, Rusape and Inyanga (Nyanga). In Bulawayo the instruments were issued to St George’s School and later transferred to the Lawley Road site in 1903 with the arrival of Father Goetz. At about the same time, a policy was adopted of supplying rain gauges to Police and other outposts thereby increasing the number in use considerably. Daily rainfall reports, synoptic charts and experimental weather forecasts started in 1922. Regular weather forecasts for the country started in 1924 through the press and by telegraph to all Post Offices. Scheduled aviation services commenced in January 1932 resulting in the opening of new Meteorological Offices at or near aerodromes at Bulawayo and Salisbury (Harare) in July 1936. At this stage, most of the 30-odd synoptic stations were at Police Stations issuing one to three reports per day. 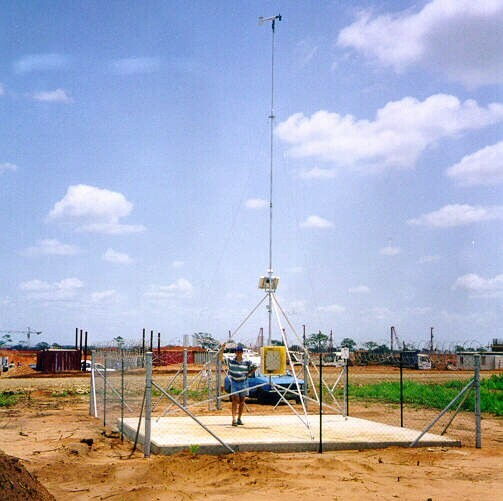 Following the commissioning of Lake Kariba in the late 1950s, a network of Seismic monitoring stations was established in Bulawayo, Karoi, Mt Darwin and Chiredzi. Currently the Zimbabwe Meteorological Services has a network of about 64 full time and part-time meteorological observing stations around the country and more than one thousand volunteer rainfall-observing sites. I recall the Mutare station was sited at the fire station and had a couple of Stevenson screens although I can’t vouch for it’s current state! There would be very little UHI effect due to the lack of recent (20 years) development. ( lat=-18.9718258998, lon=32.6654821465).